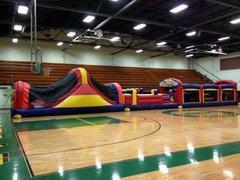 If you're looking for a challenge, Dayton Inflatables has the best obstacle course rentals in Dayton, Springboro, Kettering and the surrounding areas. These fun inflatables are perfect for corporate events, school field days, backyard birthday parties, church events and more. Your guests won't be able to kick their shoes off fast enough to line up for their chance to race through the obstacle course. 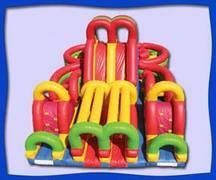 Kids and adults alike will have a blast while racing through the pop ups, tunnels and slides. 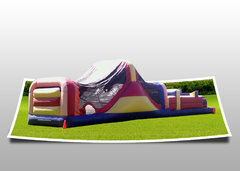 When it comes to larger events, the best part about our obstacle course inflatables is that there are a constant flow of participants, so they are perfect for large events with lots of participants. With several different options to choose from, we certain we'll be able to provide the perfect choice for your next event. Are you ready to really blow your guest's minds? 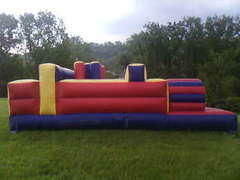 Take a look at our 79' obstacle course. The flagship of our fleet, this beauty will be the center of attention at any event. Perhaps our Adrenaline Maze would be a better fit for your area. 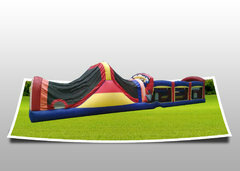 This inflatable obstacle course is ideal for safety because participants enter and exit on the same side, so you can make sure the coast is clear before sending through the next challengers. 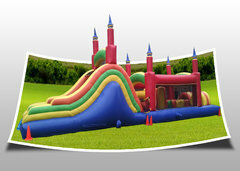 With its tall spires and exquisite design, our Castle Obstacle Course is a huge fan favorite. With all these great options, the toughest part will be deciding which one to choose. Don't forget, we also offer delicious concessions machines to make your next event complete. Also, be sure and head on over to our carnival game rentals page as well. 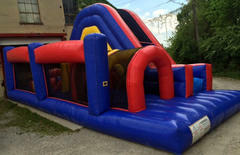 When it comes to the best selection of obstacle course rentals, nobody comes close to Dayton Inflatables with selection and service. We proudly serve Dayton, Springboro, Kettering and other surrounding areas. Browse the selections below and click the image or title for more information and to request a quote. We welcome all questions, so please contact us for inquires and orders.